Derrick Rose is determined to return, even if it means severing both legs to avoid injury. Chicago, IL – After suffering a torn right meniscus, Derrick Rose will return to the Chicago Bulls lineup tonight as the team takes on the Orlando Magic. Rose is determined to not let any future ankle or knee injuries impact his ability to play for the remainder of the season. 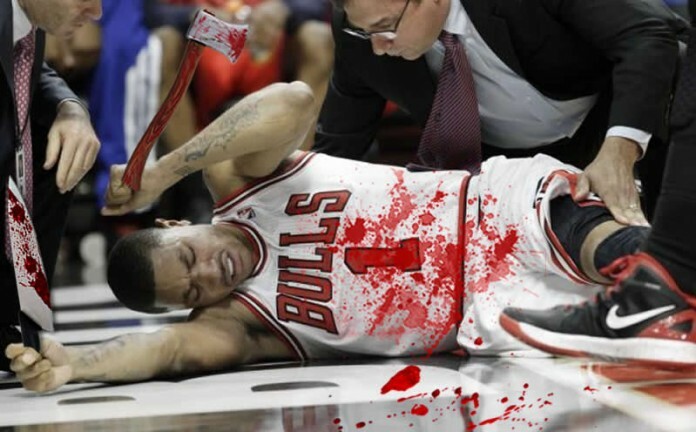 You may ask: How will Rose ensure he remains healthy and free of leg injuries? Easy. By severing both of his limbs. Rose, who underwent surgery on Feb. 27 to address the damaged part of his torn right meniscus, chopped off both of his legs during Sunday’s game against the Cavaliers. “There I was on the bench watching my team lose to Cleveland, and I knew I had to do something,” said the 2011 MVP as he cleaned up the pool of blood gushing from a dangling femoral artery. Team doctors are cautious yet optimistic on Rose’s condition, saying that he “looked really good” going into tonight’s game at the Amway Center. They have also ruled out the possibility of future injury to his ankles… mostly because he doesn’t have any left to injure. Coach Tom Thibodeau and Bulls fans were angered and confused when referees called traveling against Rose during the first minutes of the game Wednesday night. Rose was noticeably frustrated with his torso as he rolled himself back to the Bulls bench. Teammate Joakim Noah praised Rose for his courage and commitment. “He’s got a whole lot of heart, but not a whole lot of legs… and we love him for it,” said Noah. Rose is expected to lose his endorsement deal with Adidas.